I am in full Holiday entertaining mode here. I received this amazing recipe from our sponsor, Watson's Catering and Events..they tell me that these Maple Spiced Nuts are soo delicious and perfect to put out on your holiday entertaining bar cart. Also I was lucky to be able to visit Watson's kitchen and showroom yesterday and take a look around as they were getting ready for a party. I am so excited to share it with you! 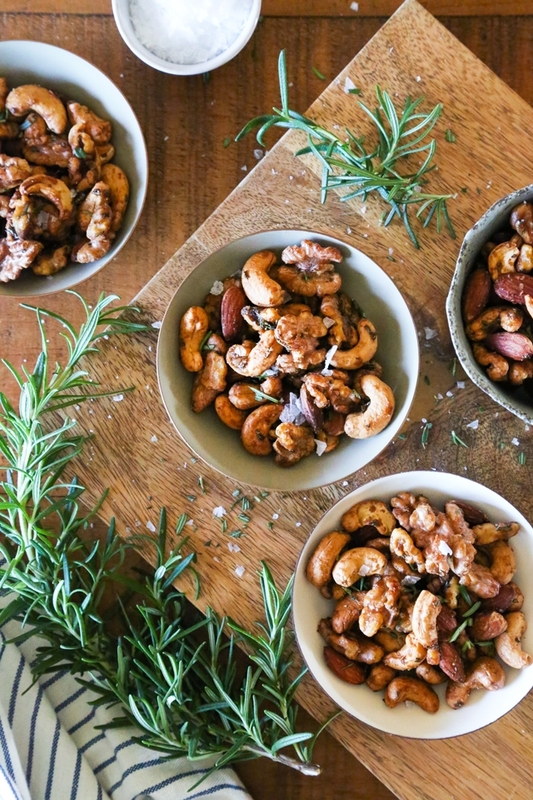 Mix the nuts, rosemary, cayenne, maple syrup and salt in a medium size mixing bowl. Spread the nuts on a half sheet tray and bake in the oven for about 15 – 20 minutes. After about 10 minutes stir the nuts on the tray. Remove the nuts from the oven and place them in a bowl to cool.